We woke up yesterday and it was just another day for us. For many around the Detroit area, that was unfortunately not the case. It never really made national news as it would have had it taken place in a bigger city along the East or West coast, but on Monday evening, the Detroit area was hit by the worst flooding the area has ever experienced in history. As water levels rose throughout the night, the damage across the area was mind boggling once the sun rose Tuesday morning. Rain is what happened. Lots of rain in a short period of time. The area got 4.57 inches of rain, most of which fell between the hours of 5pm – 9pm. To put it in perspective, August usually sees a total of 3 inches of rain. We got that plus 50% more in just four hours. A slow moving system of rain provided light rain throughout the day, which was no big deal, but a stronger part of the storm came over the area around 5pm, and the entire system ran into another system further north…and basically just stopped. When I pulled up the radar on my weather app, you can hit a ‘Play’button which animates the radar for the last hour. It barely nudged. The blob on the radar would normally pass through in 15-30 minutes on a normal storm, but it stuck around for a few hours, with devastating results. The thing about this type of ‘weather stall’ is that it is basically impossible to forecast until it’s actually taking place. For a few hours, it poured. It poured more and then when it seemed like it was done, it started pouring again. Many storms have a period of heavy rain that might last a few minutes to a half an hour. It was steady for hours. More than once I would hear the rain let up (but not stop) and figure it had to be done, only to have it start up even stronger. It was past dark before it finally calmed. Only one day in recorded history has ever seen more rain. In July 1925, one day saw 4.74″ inches of rain, a scant 0.17″ more than we had on Monday. However, everybody agrees that because of the changed landscape, the flooding from Monday’s event was way, way worse. In 1925, you didn’t have as many roadways, buildings, parking lots, and other hard surface areas, all of which create runoff and reduce the ability for the ground to soak up the water. In 1925, you didn’t have the complex sewer system that exists today, that under normal circumstances diverts water from where you don’t want it to someplace harmless, but when it starts backing up, can put lots of water in the worst possible places. In 1925, you didn’t have sunken freeways that filled up with up to 14 feet of water once the water started cascading down, the sewer lines filling to capacity, and the pumps shutting down…or in some cases literally washing away. As I mentioned above, the coverage didn’t get much national attention. Detroit doesn’t seem to get a lot of love, and honestly, the media was focused on the sudden death of Robin Williams, so that it barely got a blip for most of the day. However, locally it was all that anybody was talking about as people woke up and saw the real extent of the damage. I have a feeling that it will become a part of local lore and people will pass along stories of their memories from the 2014 Flood. 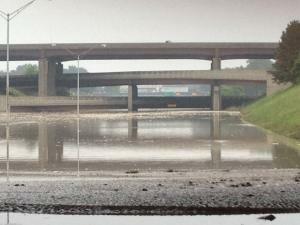 This is the area of I-75 and I-696, which as of Tuesday morning was under 14′ of water. Courtesy: MDOT. Around the same area, the service drive buckled, at one point, taking out the entire pumping station in the area. An embankment around the interchange collapsed and will have to be rebuilt. Engineers will have to study others that could possibly be damaged. Every other major freeway in the area had at least one shutdown due to flooding. And, we love our freeways here in Detroit, so that is no small number! 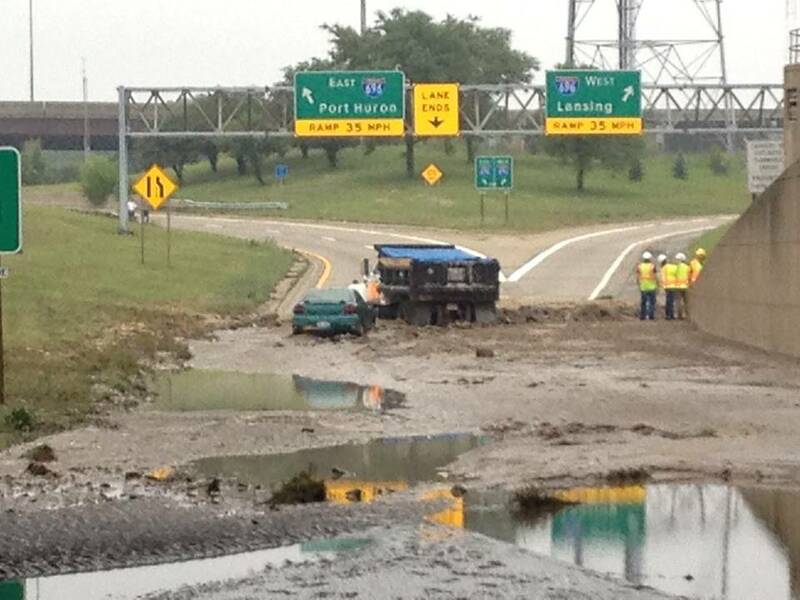 After the water subsided around this part of the interchange, the amount of mud left behind was incredible. Courtesy: MDOT. Plows aren’t going to be just for winter around here as roads will need to be scraped clean before they can be reopened. Courtesy: MDOT. 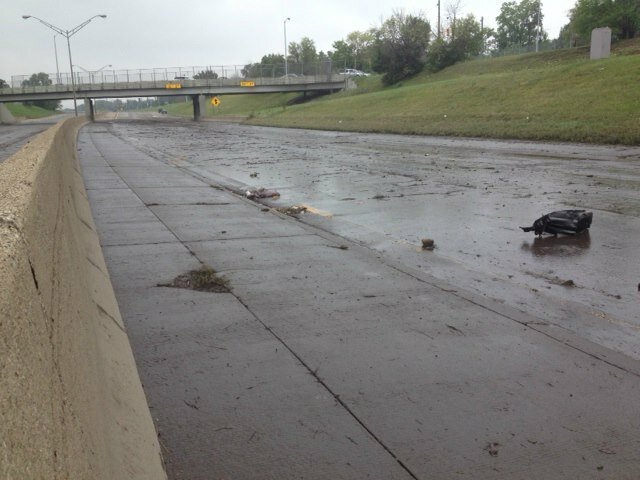 There was a pumping station located here to pump water from the roadway below. 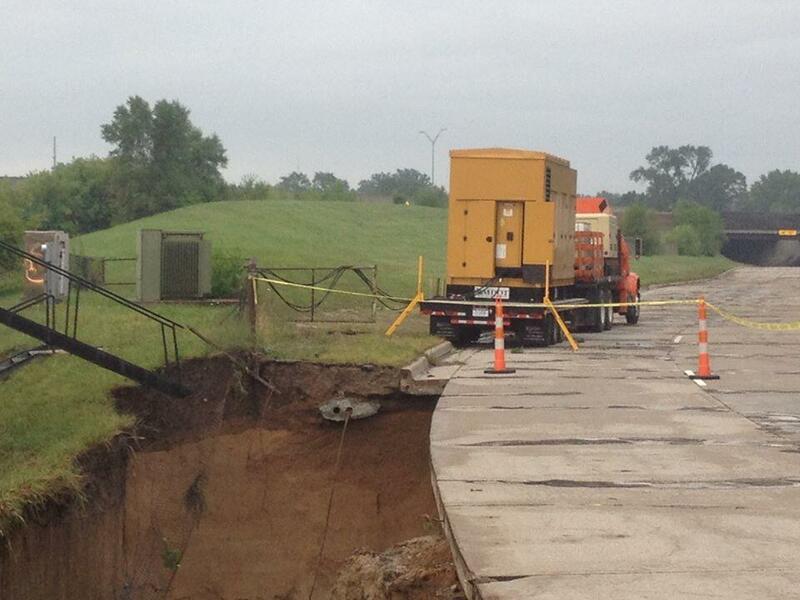 It was completely washed away and will have to be rebuilt (along with the adjacent roadway). Courtesy: MDOT. A pizzeria that I frequented many times served as a place for people desperate to get off the road to gather within, until water started rushing in and people were literally standing on tables. One of those people not only had a flooded basement, but was asking for help if anybody had cat litter and a box available. Her box had gotten submerged, as had her spare supply of litter. Poor kitty! There were so many pictures of cars submerged in water that you forgot what a big deal this is to have happen. Insurance adjusters will be crazy busy. Other manufacturing plants were shut down or at reduced capacity because of flooding and because suppliers could not get their trucks through. Personally, we were lucky. We had no flooding. Our sump pump kept up no problem. We were at home shortly after 5pm (from getting haircuts for my son and I) so everybody and our cars were safe and sound. I went the next day to check on our camper, and she stayed snug and dry as well. We are lucky. And we are thankful. Readers, what type of natural disaster have you witnessed or been close to? Wow, that’s a lot of rain! we got a lot of rain in our area of the Midwest earlier this Spring/Summer. so much, in fact, that on Father’s Day weekend my brother had to find an alternate way home (we were both visiting our parents for the day) because roads were closed or washed out. Glad to hear everything is ok in your specific neck of the woods! Glad to hear you and your family are fine. As for this erratic weather we’re having, so many people have mistaken “global warming” to mean it will be warm everywhere with similar weather patterns. But scientists have now changed that term to “climate change” to better define what this actually means – erratic weather patterns! Between the harsh winter in north east and now this rain storm (oh, and our 3-year drought here in the west), sounds like our weather isn’t going to stabilize anytime soon. I know, climate change became the new buzzword. I get it and I know we affect the planet but I’m not sure that everything we attribute to climate change is our fault. When I started looking at the reasoning for this, there were a lot of technical things that happened at once. A front moved into a bigger one so it stalled. We had low pressure so the atmosphere was saturated. This all happened around the hottest part of the day, which tends to create the most instability in the atmosphere. Another weather system happened to start pushing against things, causing wind shifts that were abnormal. Basically, it was the ‘perfect storm’. I’m not sure that could necessarily be attributed to climate change. Now if it starts developing into a pattern, then yeah, but for now, I look at this as just a (hopefully) once-in-a-lifetime thing. Glad you guys are okay. There was some very localized flooding near us last week – one are got 6.5″ of rain in 5 hours, and 4.5″ of that fell in just over an hour. Some streets had over a foot of water. Luckily no one was hurt and the emergency response was good. It was hyper local, though – just a couple of miles away where I work, we only got 2.5″ of rain in the same hour and while it created conditions where people who could pulled over and stopped driving (some on lunch break did this and waited the better part of an hour before they felt safe to drive), it wasn’t enough water to overwhelm the drainage systems. If it were that localized then the drainage system could spread it out a lot more quickly than what we had which was basically the entire drainage system for miles and miles being innundated at once. Glad it was nothing major for you. I did hear about the weather there, it did make the nightly local news here (Chicago). Only a short clip, but it looked really crazy. One always hopes nobody got seriously hurt in a situation like this, but when we’re talking about 14 feet of water, it’s not a guarantee. You’re probably right about this being something that would have received much more attention in a higher profile city. I suspect that Detroit in particular is overlooked due to the perception that the city proper is a longtime disaster of a different kind. Which is too bad, because people are people regardless of economic blight, and there are millions within that area. I should note that I once spent a few months in the northern suburbs there on a work assignment some years ago, and liked it! On a separate note, it sure seems like water is a major factor in so many disasters. Be it storm surge from Hurricanes, tsunamis, flooded rivers, or a deluge like you described – water seems to be involved somehow. Crazy pictures. I saw one of a flash flood ripping into a hospital! Glad nobody got hurt. Wow, glad you and your family are ok! I have a friend from college who lives in the Detroit area and I noticed she had a few things posted on Facebook about getting a ton of rain one day this week, but had no idea it was this bad. I’ve been through a few earthquakes, nothing over a 5 though and have had some near misses with tornados here in the Midwest, but thankfully nothing too crazy. Yeah, the Midwest is usually pretty immune to natural disasters, we aren’t around any major fault lines, coastal areas, or in tornado alley. This is probably the biggest chance of a natural disaster. It was so localized, but that it went over the major population center of the region, it’s going to be a big deal. Tens of thousands of basements were flooded, cars ruined, and only now is the real damage to the infrastructure (roads or sewer lines now collapsing) coming to light.